Only a mutual acceptable solution on the name will normalize Greek-Macedonian relations and will facilitate Macedonia's Euro-Atlantic hopes, said Dora Bakoyannis, the Greek Foreign Minister. Stating the name of Macedonia as the sole open issue in the bilateral relations with Greece, Bakoyannis noted that Macedonian leadership should follow the constructive approach demonstrated by Athens. 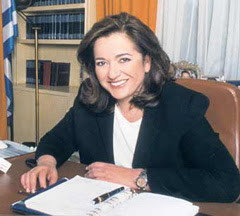 "We are waiting for the other side to demonstrate a constructive spirit in order to find a single solution (on the name), which would lead to full normalization of our relations and will facilitate the Euro-Atlantic hopes (of Macedonia)", Bakoyannis wrote in her article "Greece 2007", published in a special edition of the "Economist". Broadening the topic of Euro-Atlantic integration to the entire region, Bakoyannis pointed out the European perspective of the Western Balkan's countries and Turkey stands as the strongest guarantee for securing permanent peace and stability in South East Europe.